The Foobler is a Timed and Self Reloading Puzzle Feeder for Dogs. Qith 6 timer activated food pods it’s like having 6 puzzle toys in one that delivers a full day’s worth of regular kibble or treats for dogs to enjoy. Fill Foobler with up to 2 cups of kibble or treats and set it to release at 15, 30 ,60 or 90 minute intervals for up to 9 hours a day. A real metal bell rings when its time to feed. A dog’s natural instinct is to hunt and forage for food. It keeps their brain and body active and engaged. Foobler reinforces this natural instinct for dogs to enjoy earning their meal. -Spaced-out feeding allows fast chewers or obese dogs to digest food. 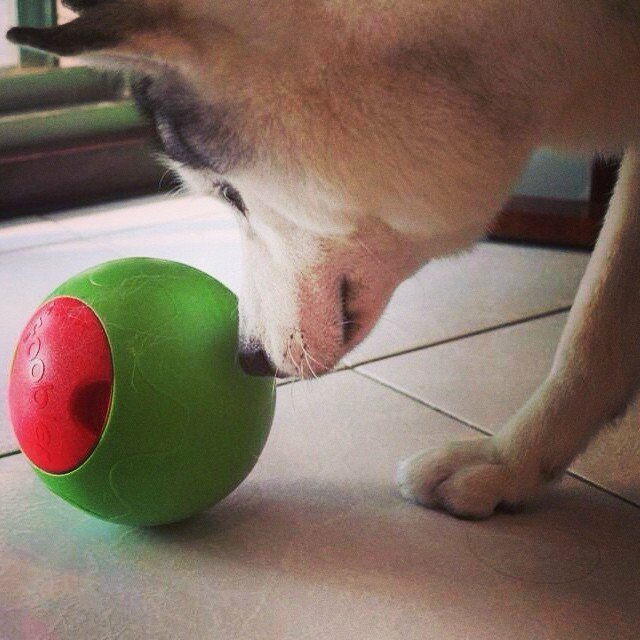 -Spaced-out timed feeding allows your dog to engage the whole day with one toy. Great way to help with separation anxiety in dogs. Disassembles in 3 pcs so that you can easily wash the food chamber. Its a tumbler, so the food dispenses out evenly no matter how you dog plays with it. Smartchip inside Foobler automatically deactivates after all 6 compartments rotate. It can also detect if battery is low or the power pod was inserted incorrectly.